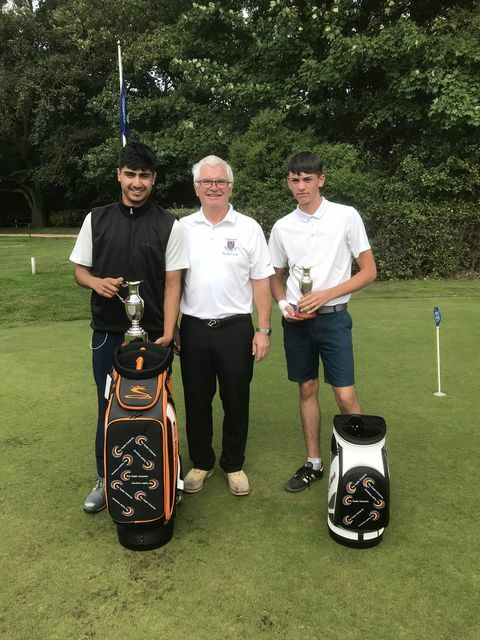 The final round of The Copier Company 2018 Junior Order of Merit was held at Horsforth Golf Club. The 3 contenders who had a chance of winning the coveted Copier Company Golf bag and the claret Jug all turned out. Early OOM leaders Cameron Owen (Oulton Hall) and Daniel Lee (Sand Moor) played well scoring 73 and 77 respectively. However, Nathan Ali (Cookridge Hall) shot a fine 72 to win the gross competition on the day and retain his Order of Merit title. Nathan won 3 events, came second in two, to claim 470 Order of Merit points. Runner up was Cameron on 430 points with Daniel on 425 points. James Lax (Horsforth) carded a superb nett 66 on the day to claim 100 OOM points. However, long time leader Maclain Simpson (Wike Ridge) won the Nett Order of Merit on 457 points. Jake Wallis (Oulton Hall) was runner up on 403 points. Nathan Ali and Maclain Simpson pictured with their Copier Company OOM Golf Bags alongside Union Executive Member David Johnston. The Union is grateful to Steve Cavanagh of The Copier Company Ltd for its generous sponsorship of Junior Golf in Leeds & District.